Monday, September 3 - regular classes cancelled. Join Jeremy for open gym from 10am-12noon. Tink's Grassfed Beef, a local Georgia farm, will be making a delivery on Wednesday, September 5th. 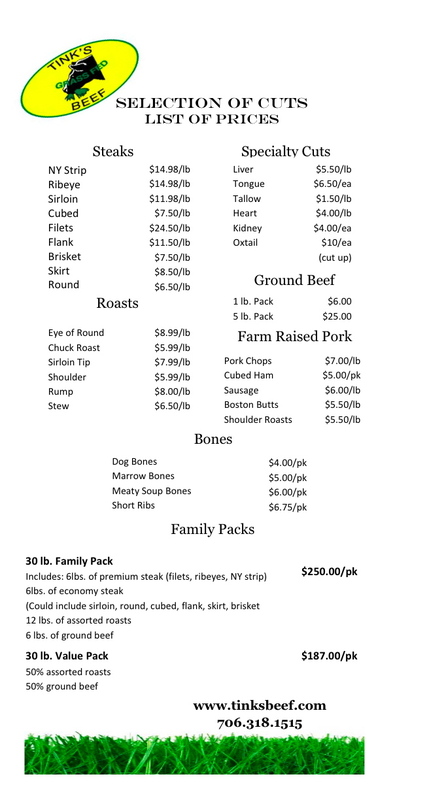 The price list is below. Orders are due by Tuesday at 5pm. Email info@tinksbeef.com to place your order. I have ordered from them regularly and love their meat! I'm so excited to start this relationship with them. Hopefully it will become a monthly delivery. The first CFM LADIES NIGHT is coming! Join your fellow CFMidtown Sistas next Friday as our neighbors at Fab'rik host us for a shopping party from 7 to 9 pm. They're offering us a special discount and drinks will be served. Even if you don't plan to shop, join us for some good times outside the box with the girls! 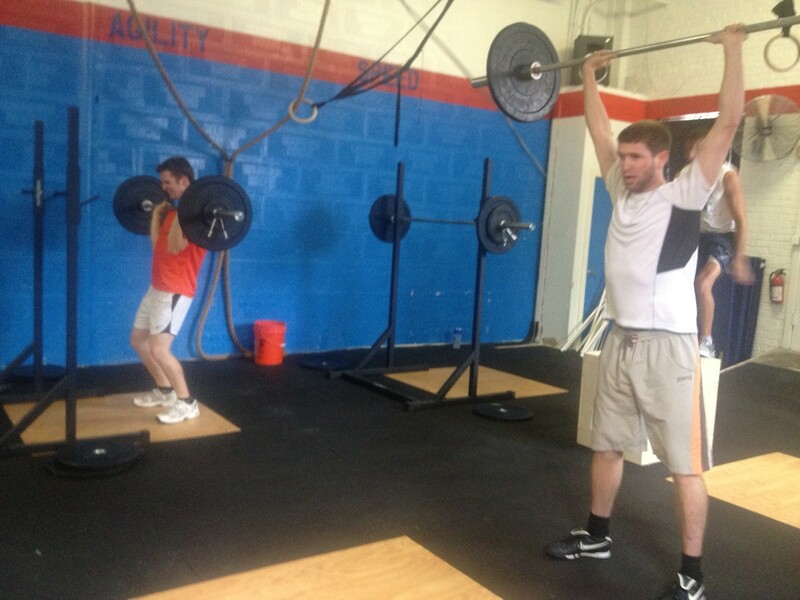 Two of our favorite Irish men, Colman and Paul, crushing some push presses. THURS 08.29.12 Athlete Profile: BRIANNE V.
When she's not breaking hearts on the basketball court, Brianne is also an awesome Hooverballer. Come out to see her in action (and play along) this Sunday at 10 am. When did you first start CrossFitting? : July 2010 - have been on and off over the years. Just came to CFM after going through physical therapy this year. Favorite WOD: Pretty much anything that doesn't involve overhead squats. Any workout that has double unders is now my new favorite because NOW I CAN DO DOUBLE UNDERS! Yeah! Three words to describe you: Intelligent, modest, and awesome. How did you first get exposed to CrossFit? Take us back to your first WOD... what was it, and how did it feel? I went to CFATL. I went through the intro course and my first workout was Fight Gone Bad - I scored a 169. I was skeptical at first because it was so expensive and they were trying to convince me that whole grains weren't healthy but I decided to try something new. What sort of changes have you seen in your body, health and fitness since starting CF (before/after)? When I started at CFM it was literally like starting brand new all over again because I had just spent four months in physical therapy for shoulder, hip, and lower back issues. I've been at CFM since the beginning of June and I already see a huge improvement in my strength (just PR'ed my deadlift by 55 pounds y'all! ), endurance, mental abilities (I think I can I think I can), and attitude. What sort of changes in your life have you experienced out of taking on something like CrossFit that were totally unexpected? The mental change. You really have to learn how to focus and get into a certain mental space that supersedes anything you may be feeling physically. That change has transferred over into other areas of my life with positive results. Any advice for people just getting started? Don't tell yourself you can't do it - otherwise that's exactly what will happen. Just focus on your breathing, remember any pain/fatigue/etc is only in your head and break down the reps as much as you need to - if you just do 5 then there is no reason you can't do 5 more. Also - do mental math as a distraction. I've become a beast at doing fractions in my head to make it through a workout. What are your hobbies, interests and/or talents outside of CrossFit? Eating, reading, bowling, swimming, traveling, meeting new people, laughing at myself, and climbing stairs. What did you eat today? I had a Lara bar, an apple, and some almonds for breakfast. Just had lunch at Marlow's Tavern and I had the pita club. It was amazing - ham, turkey, bacon, arugula, tomato, with wasabi mustard. Do you follow the paleo or primal lifestyle? What is your nutrition philosophy? I attempt to follow primal/paleo. I think I am doing well but then when I actually keep a food log I can do better. I can't wait to do the WLC challenge (Lis can tell you how excited I am about this - Lis can we talk about the challenge now?!?) so that I can become more disciplined in my diet and really give my body the foundation it needs to perform well and be healthy! Rest 2 minutes between all sets, except sets 4&5, when you will rest 8 minutes. WED 08.28.12 Whole. Life. Challenge. Do. It. The Whole Life Challenge - what's holding you back? When you complete the Whole Life Challenge, you will have expanded yourself beyond what you now believe your limitations are, and you will know yourself as an entirely different kind of human being when it’s over. A human being who doesn’t suffer from “that’s just the way things are,” but one who knows how to take dramatic action and get dramatic results. A human being who has power over outside circumstances and lives a life not of restrictive rules but of immense personal vitality and satisfaction. One who knows that “perfection” is a myth and real health and fitness lives in its pursuit and practice. We are doing this as a group, and you will have tons of support from your fellow members. If there is anything that we know, it is that awesome things are possible inside of this community. Contact Lis or Courtney if you have any questions. Let’s do this! As my life is settling down a little, I've been able to get back to doing some daily reading. One of my favorite blogs is The Daily Love (thanks to CFM member and chiropractor extraordinaire Dr. Austin Cohen for turning me on to this one!) ... it's a great dose of daily inspiration that helps me start the day on a positive foot. As I was reading back through the archives of another blog I love - Balanced Bites (awesome paleo recipes and holistic health tips), I found this post that I find very relevant to all those currently waffling over whether or not to join the Whole Life Challenge (WLC). Read this over and think about what's holding you back. Is it past negative behaviors that might rear their ugly head and affect your performance in WLC? Or are you a little scared to see how good life could become? What's your typical mindset? Check these blogs out, and post in the comments to let us know what other blogs you enjoy reading regularly (not counting YOUR favorite AND mine, the CFM blog right here, of course!). 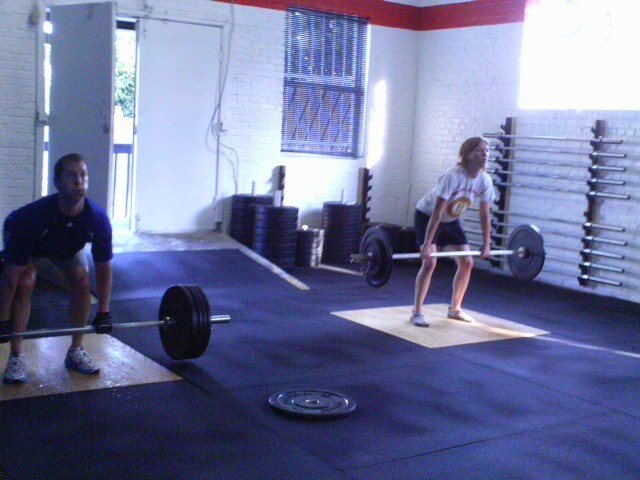 TUES 08.28.12 Athlete Profile: KERRY M.
Kerry and Anna rocking some cleans. lackluster results and poor form that nearly shredded my shoulder, I was just about ready to quit. 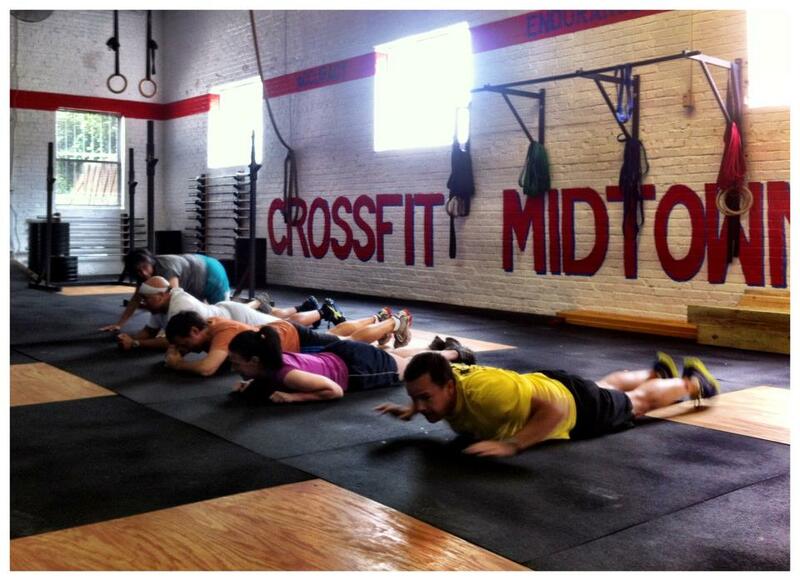 Then, I moved to Atlanta and a few weeks later CrossFit Midtown opened up only a block away. I joined in June and have loved it! Favorite WOD: Call me crazy but I like WODs with pull ups. Least Favorite WOD: Any AMRAP. Tell us about your sports & fitness background: I played varsity tennis, wrestling, soccer and football in high-school. Even managed to be selected for GA All-State Football in 1994. After that high point, I went to college and basically stopped doing anything that closely resembled exercise. About 10 years ago I reached a peak of slothfulness and finally decided to get moving. I enjoyed spinning and exercise classes until I heard about CrossFit. I went in on a Saturday and the WOD was "Fight Gone Bad". I gave it my all, was beat by most of the girls and still nearly croaked. No really. Turns out I had "rhabdomyolysis", which is where muscle fibers are damaged and released into the bloodstream, often causing kidney damage. Seems that it's often seen in 30+ year old guys who think they're still 18. I haven't done Fight Gone Bad since! What sort of changes have you seen in your body, health and fitness since starting CF? I can carry my 9 and 6 year old kids around the house while dodging our barking dog. What sort of changes in your life have you experienced out of taking on something like CrossFit that were totally unexpected? I have more confidence in all aspects of life and have met some really great, interesting people. Any advice for people just getting started? You will second guess your decision to start CrossFitting for the first few weeks. Don't give up! Follow your instructor's guidance. Push yourself every day and you will soon be missing the days you can't make it into CFM! What are your hobbies, interests and/or talents outside of CrossFit? Living my life for Jesus Christ and spending as much quality time as possible with my wife and kids. I also enjoy bird hunting and scuba diving. What did you eat today? Well, I thought about eating 3 cookies but I only ate one. That counts as progress--right, Lis?! Do you follow the paleo or primal lifestyle? What is your nutrition philosophy? No. I might try it one day but for now I eat healthy "family" meals with lots of chicken, fish, veggies, nuts...and cookies. Strength symmetry is desirable for reducing the risk of injury associated with high repetition of movement, as found in many CrossFit workouts. The reason symmetrically equivalent strength levels reduce injuries is that when imbalanced muscle groups work together, the stronger side will attempt to compensate for the weaker side, creating undesirable torque on the musculo-skeletal system. Imbalances in strength or range of motion between the right and left sides of the same muscle groups may never be fixed by barbell work alone due to continual overcompensation. Only when each set of muscles is exposed to the same stimulus over time can strength symmetry be achieved. 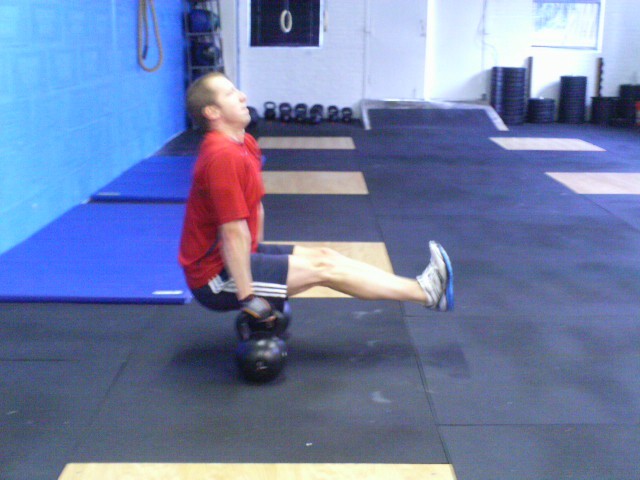 The best way to ensure the same stimulus is to use single arm or single leg movements with the same amount of tension. The single-arm and single-leg movements that you implement into your training will help ensure that you come closer to strength symmetry and therefore reduce your overall risk of injury. The gregarious Olivia has a new little brother now. Congrats to the Dyers on the birth of Samuel James on Saturday. New pull up rig gets installed today!!! Happy Birthday week indeed! Who wants to go to Paleo Night Tuesday at Urban Pl8? Email Courtney if you want to attend and we'll make the reservation. Let's get together to break a sweat for the free August Community WOD at lululemon howell mill on Sunday at 10am. We're heading to brunch afterward at Urban Pl8. I hope to see lots of CFMers there representing in your shirts! And mark your calendars for the next Community WODs on September 30th. In addition to Hooverball, monthly lululemon WODs and the Whole Life Challenge, there are lots of other active events happening around town this fall... check 'em out and email Alicia if you want to register so we can plan carpooling and matching knee socks. Sat, Sept 8 @ 8am in Alpharetta - Gilby's Gauntlet: Four mile CrossFit-obstacle run benefiting the Leukemia & Lymphoma Society. It's two 1.9 mile loops with nine obstacle stations including things like overhead walking lunges, jumping pull ups, ground-to-overhead, sled pull, farmers carry, and more. Scalable for all levels. Sun, Sept 9 @ 8:30am in Atlantic Station- : Stephen Siller Tunnel to Towers 5K Run/WalkThis 5k Run is presented by the Stephen Siller Tunnel to Towers Foundation and the Gary Sinise Foundation who are “Building for America’s Bravest.” Proceeds from this race will go to building “Smart Homes” for two Georgia triple amputee veterans. Sat, Sept 29th AND/OR Sat, Oct 6th at 9am - Atlanta Affiliate League East vs. West Team Competitions: Mixed and Elite teams of 4 to 6 will compete in WODs throughout the day. Let's pick a day and send a few teams to compete! Rusty, Vanessa, Dermot, Wayne and Anami in the noon class rockin' some burpee leap frogs last week. Animal warm-up Friday is back again! Anna just returned from an amazing vacation. 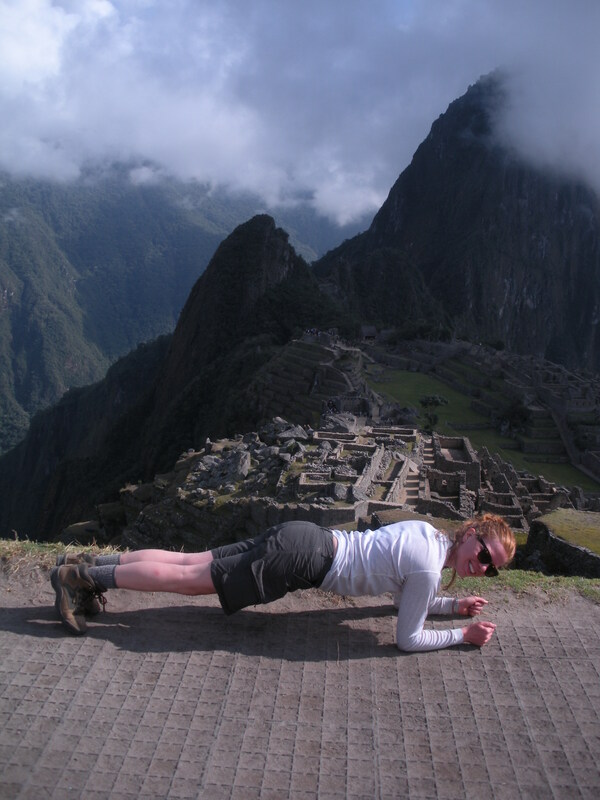 Here she is showing off her new-found plank strength overlooking Machu Picchu! Tell us about your sports & fitness background: not much to say... I used to run cross country, swim, and play golf in high school. In college I was on crew. Since then I would ride my bike around town and tried a go at the Y what with their fancy computerized tracking of reps and sets, but it didn't last. You need community! How did you first get exposed to CrossFit? My dad has been doing CrossFit for 3 or 4 years now, and my uncles and aunts have started it too. 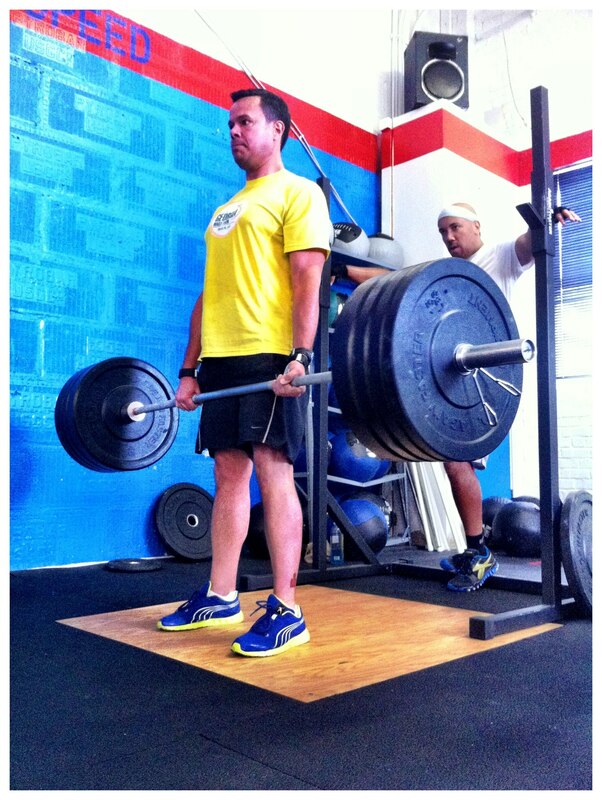 I didn't seriously consider CrossFit (initially it seemed to pricey) until I chose to change my diet to Paleo/Primal. And I'm actually saving money with the new diet (a few CSAs) and CrossFit decisions-- eating out was bad for my body and wallet. Take us back to your first WOD... what was it, and how did it feel? I'd have to check the journal to see what it was. If you count the baseline, well, I nearly fainted. Other words that come to mind: uncoordinated, pained. What sort of changes have you seen in your body, health and fitness since starting CF (before/after)? Besides the constant gun show for all my family and friends, I feel stronger, know I am stronger, and have a vitality that makes me feel that every day I am the healthiest I have been my whole life- yes, every day. 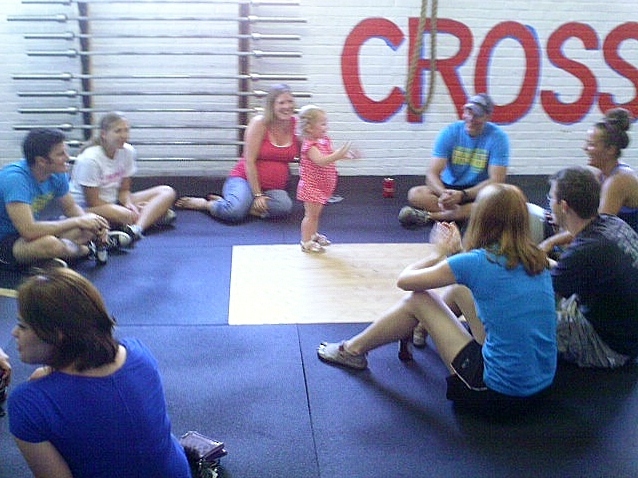 Please share with us any favorite CrossFit / CFM moments: Fran Challenge 2012. I had no idea such dramatic improvements could be possible. It was encouraging to see the results. (For the curious- my time dropped from 13:10 to 5:16). Any advice for people just getting started? You don't have to muscle it out. Work within your current capability. The transformation and strength will come. Give yourself grace and time. What are your hobbies, interests and/or talents outside of CrossFit? I like to play golf and ride my bike. Do you follow the paleo or primal lifestyle? Try to. The off-limits foods aren't in the house, but I won't say no to a croissant if it finds me. Let's get together to break a sweat for the free August Community WOD at lululemon howell mill on Sunday at 10am. We're heading to brunch afterward at Urban Pl8. I hope to see lots of CFMers there!